Simple, lightweight, robust and affordable, the EPV200 with Assist-Control is a portable mechanical ventilator designed to provide effective ventilation for intubated or non-intubated patients, maximizing medical surge response during the initial stages of a mass casualty event. This gas-powered electronically-controlled vent is extremely easy to use, and is equipped with independent inspiratory time, tidal volume and BPM controls. It also features a built-in digital manometer and a full array of pre-set visual and audible safety alarms. The Assist-Control function triggers at less than -2 cm H. O to accommodate spontaneous breathing. The weather-resistant EPV200 will run for up to 48 hours on two D cell batteries, and is ideal for stockpiling or everyday use. The item "Allied Healthcare EPV200 with Assist Control Emergency Portable Ventilator" is in sale since Wednesday, May 23, 2018. This item is in the category "Business, Office & Industrial\Medical/Lab Equipment\Medical Specialisations\Respiratory". 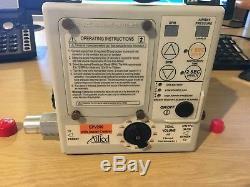 The seller is "discountmedicalitems" and is located in Nottingham, Nottinghamshire.